03.15.2008 - Here is a rare photo of a mouse in an attic. If you want to solve a problem with a mouse in the attic, you have to follow the steps I've outlined many times on this site. Step one, inspect the entire house, top to bottom, identify the areas of mouse use in the attic, and find any possible entry holes that lead into the house. Step two, seal the entire house shut, with steel repairs. Step three set a dozen or more mouse traps on the prime locations in the attic. Step four, remove trapped mice and reset traps until no more are caught. Step five, clean and decontaminate the attic. Now for a mouse in the attic poem, inspired by the customer in this house where I took this photo. Eek, there's a mouse in my attic! Squeak, I hear noises sporadic! I hope I don't sound dramatic! Yoink, there's a mouse in my ceiling! Do do some frantic squealing! Yikes, there's a mouse in my house! It's going to run down my blouse! All because of this devilish mouse. ...the customer that inspired this poem was a man, by the way. How much does mouse removal cost? Why Do Mice Go Into The Attic? - Mice, like most wildlife, are opportunistic. If the weather is getting cold they will want to have a nice warm place where to spend the winter. Or, they may be looking for a safe and comfortable place to give birth and raise a family. Attics are great places for both needs. 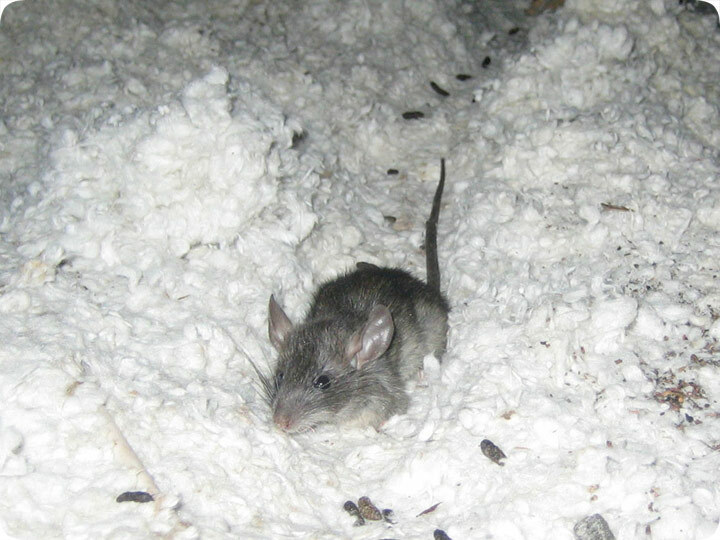 Mice there are safe because attics keep predators away. A food source is incredibly near. Space is not a problem. Nesting in all that insulation is pure heaven for them. They are warm. Mice couldn’t ask for more than that. Sometimes an opening that will lead to the attic is found serendipitously as the mice are scurrying, looking for food outside. Sometimes the mice may be actively looking around a house for an entry. Climbing all the way to the attic to find an entry into a cozy new home seems more than chance but probably isn’t. Something drew the mice to your house in the first place. Perhaps some food left outside, a garden, bowls of pet food or water bowls. After they are near the house, they will investigate and most houses have some little spot somewhere that will gain a mouse access to your house or attic. The urges to be safe, to have food and raise their young are very strong survival instincts. Attics provide all that.